Our first night passage, our first passage over three hours, our first passage out of sight of land and we need to get ready for it. We are fortunate enough to have veteran cruisers Mike and Robin on Mermaid helping us and crossing with us. They have 15 years of cruising under their belts, have made many passages and are a wealth of knowledge for us. *Check our Lifejackets.Our Lifejackets are offshore, self inflating jackets. It is pretty important that they a) inflate and b) stay inflated. While I didn't use the gas cartridge, I did orally inflate them and do let them sit over night. They inflated and were still holding air two days later. *Make a Courtesy Flag for St. Maarten. Courtesy flags are small flags of a country that are flown from the flag halyards near the mast. Each country that we visit will need a flag, and sailing through the Caribbean Islands we will encounter quite a few countries. 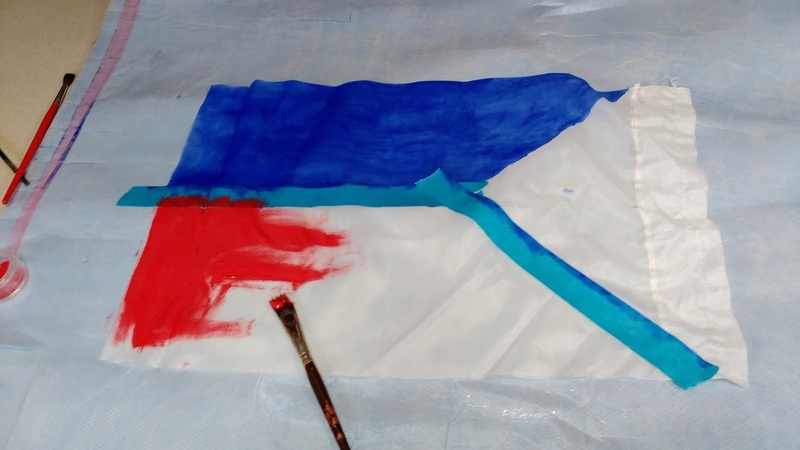 Each flag costs in the vicinity of $20, so I have been looking for alternatives. 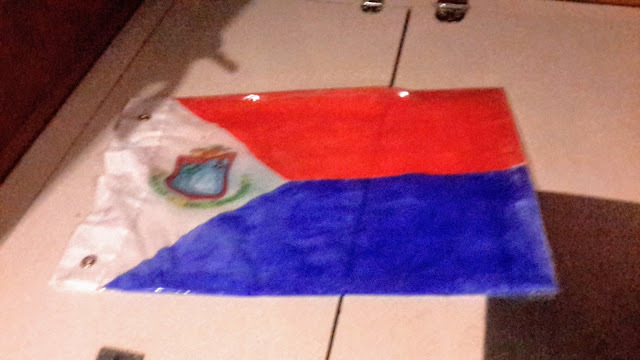 I made one for St. Maarten out of some curtain material I brought along for this purpose, acrylic paint and Sharpie permanent markers. It works well if you don't look too closely and we will see how long it holds up if to the wind and the rain. *Make a route on our chart plotter All of our other sailing has been line of sight sailing. We have only sailed in daylight, and always in sight of land. We thought we were going to get out of sight of land our first time sailing to Puerto Rico from the US Virgin Islands, but as we rounded the tip of the USVI, there in the distance we could see Puerto Rico. (I was actually a little disappointed here!) This upcoming trip is longer, approximately 75 miles, and since we will be traveling at night we certainly wanted to establish the path that we would be following. *Check out of the BVI. Ahh, customs again. We never quite know what you are going to encounter each time we check in/out of a country. Mike, from Mermaid, went to check out the day before we were scheduled to depart. They sent him away and told him to come back within 12 hours of departure. Other customs stations in the BVI have given us more time in the past to check out, but not this station, on this day. Learning from Mike's experience, we went to check out on the morning of the day of our departure. Checking out was quick and easy and cost us a grand total of $1. 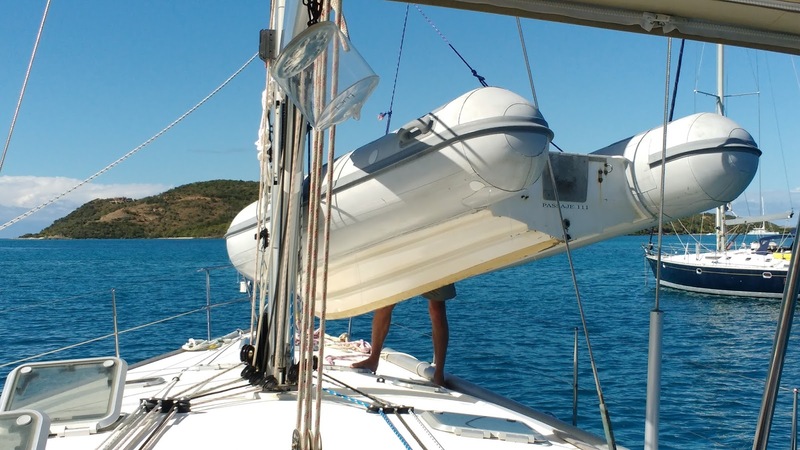 *Clean our dinghy, Melody, and put her up on deck for the passage. Melody's bottom was a bit green with growth and barnacles were beginning to grow on her. We don't want to bring those things up to Rhapsody's deck. We got in the water and scrubbed the growth and barnacles off of Melody. 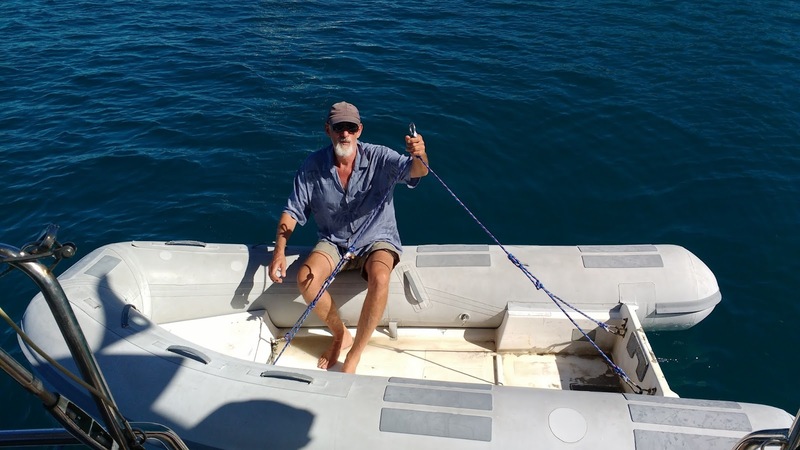 In the BVI most boats tow the dinghies behind when sailing, but making a longer passage, over deeper water, at night, we wanted to be safer and hoisted Melody up on deck. This was one of the last things that we did because as soon as Melody is on deck we are stranded on the boat. 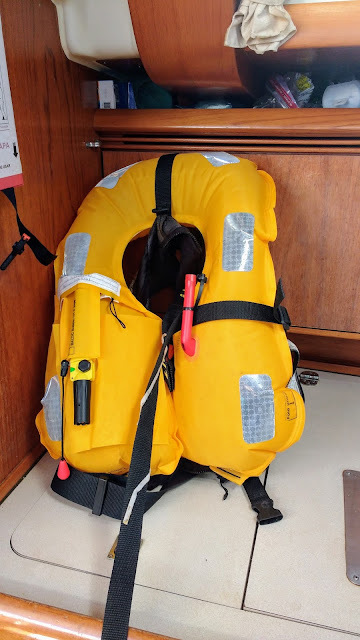 Melody is our sole means of getting to shore, so after she is on deck there is no more shopping, no more checking out - it is time to go. Motor off, oars out, harness ready to lift. Up on deck she goes. *Final preparations. We prepared some finger food to have during the passage. Things to munch on to keep us occupied and nourished. Check the instruments, check the bilge, check the oil, check our lights. I think we are ready to go. Next post, our passage notes.